Daily Turismo: Twister Winner Is Hunter! 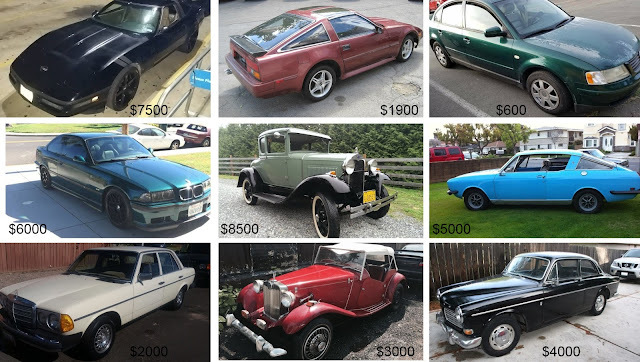 The results from Thursday's Twister Ultimate $9k Challenge are in, and it looks like Hunter had the best guess where he put every car in order with the exception of the Volvo 122 Amazon, which was an amazoning deal. Without further ado. 1999 Volkswagen Passat offered for $600 in Sausalito, CA. 1986 Nissan 300ZX offered for $1900 buy-it-now in Chester, NY. 1980 Mercedes-Benz 240D offered for $2,000 in Calexico, CA. 1952 MG TD Kit Replicar offered for $3,000 in Brooklyn, NY. 1967 Volvo 122S Amazon offered for $4,000 buy-it-now in Carmichael, CA. <---this is a steal!! 1969 Sunbeam Rapier offered for $5,000 in Arcadia, CA. 1998 BMW M3 offered for $6,000 in Santa Clara, CA. 1992 Chevrolet Corvette C4 offered for $7,500 in Dallas, TX. 1930 Ford Model A offered for $8,500 in Clearview, WA.